Great Royal Wife, or alternatively Chief King's Wife (Ancient Egyptian: ḥmt nswt wrt), is the term that was used to refer to the principal wife of the pharaoh of Ancient Egypt. The former is also, in the form of the simplification Great Wife, applied to more contemporary royal consorts in states all over modern Africa (e.g., Mantfombi Dlamini of Swaziland, chief consort of the Zulu King). While most Ancient Egyptians were monogamous, the pharaoh would have had other, lesser wives and concubines in addition to the Great Royal Wife. This arrangement would allow the pharaoh to enter into diplomatic marriages with the daughters of allies, as was the custom of ancient kings. In the past the order of succession in Ancient Egypt was thought to pass through the royal women. 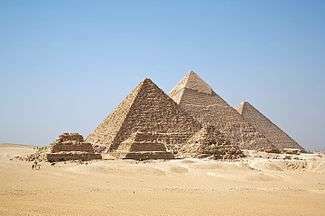 This theory, referred to as the Heiress Theory, has been rejected ever since the 1980s and is now not accepted by Egyptologists. The throne likely just passed to the eldest living son of the pharaoh. The mother of the heir to the throne was not always the Great Royal Wife, but once a pharaoh was crowned, it was possible to grant the mother of the king the title of Great Royal Wife, along with other titles. Examples include Iset, the mother of Thutmose III, Tiaa, the mother of Thutmose IV and Mutemwia, the mother of Amenhotep III. Meretseger, the chief wife of Senusret III, is the earliest queen whose name appears with this title; she also was the first consort known to write her name in a cartouche. However, she is only attested in the New Kingdom so the title might be an anachronism. Perhaps the first holder of its title was Nubkhaes of the Second Intermediate Period. A special place in the history of great royal wives was taken by Hatshepsut. She was Great Royal Wife to her half-brother Thutmose II. During this time Hatshepsut also became a God's Wife of Amun (the highest ranking priestess in the temple of Amun in Karnak). After the death of her husband, she became regent because of the minority of her stepson, the only male heir (born to Iset), who eventually would become Thutmose III. While he was still very young, however, Hatshepsut was crowned as pharaoh and ruled very successfully in her own right for many years. Although other women before her had ruled Egypt, Hatshepsut was the first woman to take the title, pharaoh, as it was a new term being used for the rulers, not having been used before the eighteenth dynasty. When she became pharaoh, she designated her daughter, Neferure, as God's Wife of Amun to perform the duties of a priestess. Her daughter may have been the great royal wife of Thutmose III but there is no clear evidence for this proposed marriage. Elsewhere, in Kush and other major states of ancient Africa, the rulers often structured their households in much the same way as has just been described. The practice of creating great wives has continued to the present day, with the most senior polygamous spouses of contemporary African royals often being referred to by the honorific Great Wife. In addition to the said queen of the Zulus, contemporary holders of the title include the numerous bearers of the Iyaafin chieftaincy of Yorubaland and the future Ndlovukati of Swaziland. 17th dynasty Sobekemsaf Nubkheperre Intef Sister of an unknown king. Buried in Edfu. 18th dynasty Ahmose-Henuttamehu Ahmose I (?) Daughter of Queen Inhapi. 18th dynasty Tenettepihu Thutmose IV? Known from a shabti and funerary statue. Thought to date to the time of Tuthmosis IV? 19th dynasty Takhat Seti II? 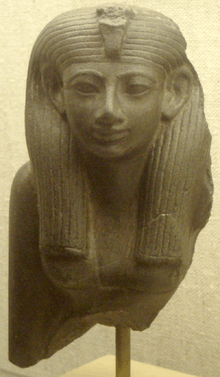 Depicted as the wife of Sety II on a (usurped) statue. May have been the mother of Amenmesse? 20th dynasty Henutwati Ramesses V Queen mentioned in the Wilbour Papyrus. 20th dynasty Nubkhesbed Ramesses V Mother of Princess Isis, who would later be the God’s Wife of Amun. 20th dynasty Tyti Ramesses X Possibly a wife of Ramesses X. Buried in QV52. 20th dynasty Anuketemheb unknown Original owner of sarcophagus and canopic jars later used for Queen Takhat in KV10. Dates to the 19th or 20th dynasty. ↑ Shaw, Garry J. The Pharaoh, Life at Court and on Campaign, Thames and Hudson, 2012, p. 48, 91-94. ↑ L. Holden, in: Egypt’s Golden Age: The Art of Living in the New Kingdom, 1558-1085 B.C., Boston 1982, S. 302f.